In the previous chapter we looked at the various markets and exchanges where we can trade these markets. Now is the time for us to clarify everything related to the detailed specification of contracts. Specification of a contract basically means a summary of essential and very important information about the commodity futures contract in a comprehensive and transparent form. You can find the specifications on the website of the exchange where the given futures contracts are traded, or directly by using some of the Internet search engines. For example, if we seek specification of a corn futures contract, we can type “corn contract specification“ into the search engine. The required information always appear on one of the first positions. 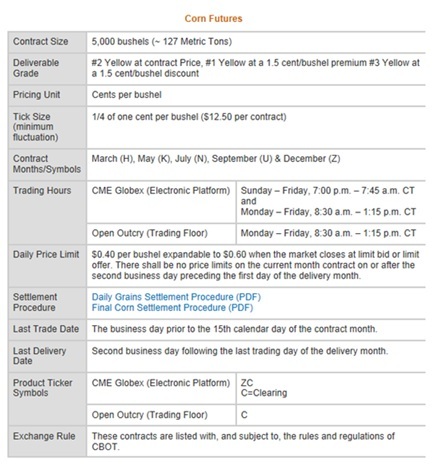 Let’s take a look at a specific example of a corn futures contract specification. Contract Size: Information about the quantity of the commodity in one futures contract. In the case of corn it is 5,000 bushels, or about 127 metric tons. Pricing Unit: This is the price unit used for the given futures contract. Pricing units are usually cents. In the case of corn it is Cents per Bushel. One tick (i.e. the lowest value by which the corn futures contract price may change) will thus have a value of $ 12.5. (1/0.25) * $12.5 = $50. Imagine that you buy a corn futures contract at a price of 456 3/4 and sell it for 460 2/4. We know the value of one tick from the exchange´s websites. So how many ticks did the corn market move? We can simply divide 3.75 / 0.25 = 15 ticks. As you can see, corn futures contracts have 5 expiration months – March (H), May (K), July (N), September (U), and December (Z). For traders, whose only interest is speculation on the increase or decrease in market prices, it is the most important information regarding a futures contract. Before we start to deal with expiration months in a more detail, let´s explain the symbolism of expiration months. Table 1 shows that each individual expiration month has a unique symbol. For example, March has the letter H. This symbolism is uniform for all commodity futures that are traded in the US. Corn futures contracts have the following expiration months – H (March), K (May), N (July), September (U), and December (Z). These letters unify submissions of trading orders to brokers and displaying of price charts of commodity futures. In the next part of this chapter you will learn how to use the symbols in practice. Yet first we have to clarify what a “ticker” is. This is also a very important information which says us on which days and times the corn market opens and closes. As you can see, the CME exchange divides corn trading sessions into two categories. The main trading session for the CME Globex electronic market (Electronic Platform) is from Monday to Friday, from 8:30 AM CT (Central time for the Chicago area, where the exchange is located) to 1:15 PM CT. In Central European Time (CET) it is 14: 30 to 19:15. In case you were interested in trading corn, this would be a crucial information for you because during these hours there are the most interesting market moves with the greatest profit potential. However, as the corn market is very popular (in Europe and other regions), the electronically-traded corn futures contracts can be bought or sold also during night sessions, i.e. from Sunday, 1:00 a.m. CET to Friday 1:45 p.m. CET. Yet I do not recommend to open or close positions at night because there is only a small liquidity and your orders may be executed with a “Slippage”. This means that you cannot buy or sell at the desired price, or close to this price, and the execution slips to far distant value. This can lead to unnecessary losses which may disrupt your trading plan. Daily limit price movements can be a double-edged sword. But first let’s explain what a limit movement is. As the term suggests, a daily limit movement is a price range within which the market price can oscillate during trading hours. This means that the market price cannot increase or decrease beyond the daily limits. In the case of corn it is $0.40 per Bushel. In terms of one futures contract, which includes 5,000 bushels of corn, the daily price limit is: $0.40 * 5,000 = $2,000. Such price ranges occur when there is a huge supply and demand. The cause may be unexpected news, disasters, etc. In such situations the exchange stops trading. So if the price of corn futures contracts exceeds the $ 2,000 price range when we are in a position, we will not be able to get out of this position. In case the price went against our long or short position we may face a high loss. In the case the limit movement was in line with our position, we could look forward to a very nice profit after the reopening of the market. Under normal circumstances we are able to control our risk for most of the time – we simply set the maximum loss we are willing to risk on each contract and if our position gets to this loss we immediately close the position. However, in case of the limit movement against our position we would simply have to cope with the loss. Remember that your trading plan (yes, you must have the same plan as in any other business) should count with this possibility. However, the good news is that limit movements are truly unique events and you don´t have to worry about them too much. You can go through historical corn prices and see how many limit movements there were during the last few years. You will find that they are really exceptional events which will not threaten you very often. The point is that you must always take this variant into account. The good news is that despite the occasional complication of limit movements we can make long-term profits in the markets. But why are the boundaries in the form of limit movements even there? I will answer this question with another question: Can you imagine an unlimited increase in the price of wheat or corn? It could have disastrous consequences in the form of world famines. Moreover many producers and manufacturers (not to mention individuals) would bankrupt. The limit movement principle lies in the fact that the exchange regulates the potentially uncontrollable price growths. So what should you keep in mind regarding limit movements? Learn the daily limit values for the commodity markets you intend to trade. If the daily range gets near to the limit value, do not open positions. If you are already in a position, rather close it. As I have already advised you, check the history and search limit movements in charts. Then integrate limit movements in your trading system and take them into account in your trading strategy. There are some markets, such as the US indices, which do not have limit movements. If you want to avoid limit movements, trading the US indices is definitely a good choice. This is mostly unimportant information for traders. As we have mentioned many times in this handbook, there will be no physical delivery of the commodities and the related financial settlement. The main and primary objective of traders are speculations on an increase or a decrease in the futures contract´s price. Remember that you should never hold a commodity contract on the last day of its trading. We have already explained this issue (Last Trading Date). If you look at corn futures contracts, the last trading day is always on the day prior to the 15th calendar day of the expiration month. For example, if you had bought a futures contract that expired in March 2013, the last trading day was March 14, 2013. Again, as traders you are not much interested in this information because you do not produce or buy commodities. This is a very important information. Here you can see the asset´s symbol used in trading. It serves, for example, for displaying price charts in software platforms or for entering trading orders. You can find examples of tickers in the chapter Futures contracts on commodity exchanges in the US. Since you will surely trade on electronic markets, in the case of corn futures you will use the symbol ZC. This is not an important information in terms of practical trading. 7. What Can Be Traded on Exchange?